Putting the reverb on a return channel, instead of dropping one reverb plug-in onto each audio channel, does two important things. First, it conserves memory and CPU: with a return channel, you can use the same reverb plug-in for multiple audio channels. Second, it ensures that different instruments sound like they’re playing in the same space. If you send a synth track and a vocal track to the same reverb return channel, the resulting reverb will sound much more coherent than if you had used a separate reverb for each instrument. Both methods will remove the low-pitched frequencies from the reverb channel, keeping it sounding clean and smooth. Automation allows you to change the amount of source signal that goes to the reverb channel over the course of a song. 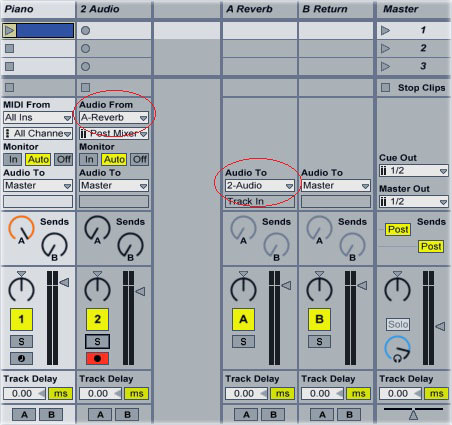 To automate the level of reverb on a track, draw an envelope on the reverb send’s automation lane. 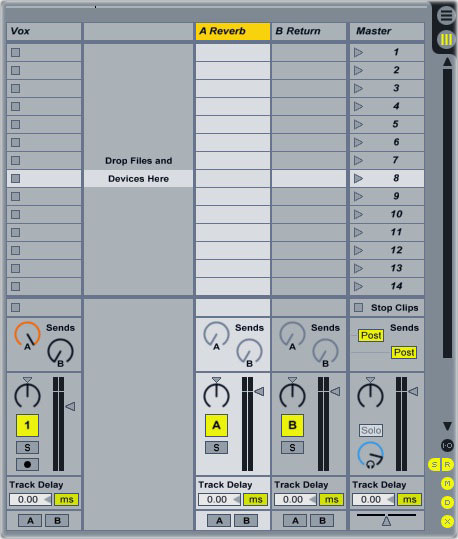 You can open a track’s send automation lane by right-clicking the send knob and selecting “Show Automation.” Once you’ve opened the automation lane, use the pencil tool to draw the envelope. The predelay controls the amount of time between the instant that the reverb receives the source signal and the instant that the echoes start playing. A short predelay setting means that the reverb will start generating echoes immediately after it receives the source sound. A higher predelay setting tells the reverb to wait for a specified amount of time before starting the echoes. Increasing the predelay gives each word in the vocal a chance to be heard before the echoes start overlapping with it.